Asthma can’t be cured, but its symptoms can definitely be controlled. Here are some Tips to manage your Asthma better. These Dos and Don’ts will help you prevent Asthma attacks and manage them better if they do happen. Work with your Physiotherapist to learn techniques to breathe better using Pulmonary Physiotherapy. Because asthma often changes over time, it’s important that you work with your doctor to track your signs and symptoms and adjust the treatment as required. Stick to Your Medicine. Taking your asthma medicine the way your doctor tells you to allows you to feel in control of your health. Be Aware of Your Symptoms. Paying attention to your early warning signs like shortness of breath or tightness in your chest, will help you take quick action helping you to stay on top of your asthma. Follow Your Asthma Action Plan. Be sure to discuss your action plan with your doctor. Your action plan will guide you to good asthma control. Know your zones and follow your plan. Stay Calm. Keep calm if you have an asthma attack. Follow your action plan. Know Your Peak Flow Zones. Peak flow meters are used to check your breathing and these readings allow you to know how you are breathing. It can signal problems early and help to avoid breathing trouble. Avoid Your Asthma Triggers. Know and stay away from the asthma triggers that make your asthma flare-up or worsen. Talk to The Right People. Talk with your doctor. Talk to your family, school, or friends about asthma and control. Let them help. Don’t Delay. Know the signs when your asthma is getting worse. Act fast. The faster you act, the faster you will be in control. Don’t Be Around Smoke. Smoking increases and worsens asthma attacks. Don’t Stop Exercising. Be sure to check with your doctor about exercising, sports, and other activities. Staying fit will help to keep you healthy. Don’t Open Windows during Summer and Autumn. During allergy seasons, prevent pollen from entering your home or car. Try to stay indoors when the pollen count is high (from about 10:00 AM to 4:00 PM). Avoid freshly cut grass. Don’t Have Pets in your Bedroom. Be pet smart. Carpets and cloth-covered furniture trap dander (animal fur). CHRONIC –This means that the disease lasts a long time and is always present. While the symptoms may take years to develop and the severity may differ at times, there is still much you can do to slow the progress of the disease. OBSTRUCTIVE – The ability to move air flow in and out of your lungs is blocked or obstructed. This is caused by swelling and extra mucus in the tubes of the lungs (airways) which carry air in and out. PULMONARY – This means that the disease is located in your lungs. DISEASE – Your lungs have some damage. But even though a cure hasn’t been found yet, your symptoms can be treated. Why does COPD Happen ? Smoking is the most common cause of COPD. (About 80-90 percent of people with COPD smoked.) The likelihood of developing COPD increases with – the more you smoke and the longer you’ve been smoking. This is because smoking irritates and inflames the lungs, which results in scarring. COPD can also be caused by breathing-in lung irritants like smoke at workplace, chemical fumes, air pollution and dust for many years. In some cases, COPD can be genetic (passed from your parents to you). 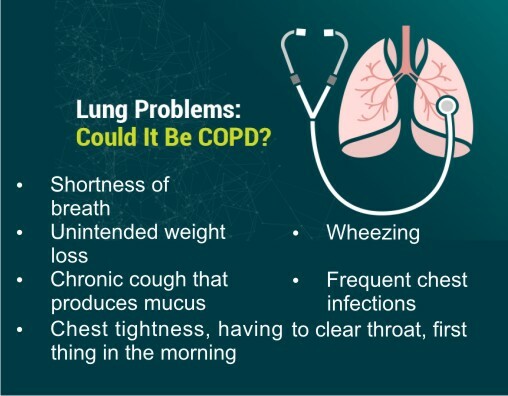 COPD is usually diagnosed after a consultation with your doctor, which may be followed by breathing tests (including Spirometry or lung function test or pulmonary function test). Spirometry measures how much air your lungs can hold and how fast you can blow the air out of your lungs. Spirometry is also used to track how your COPD is progressing. Although the damage that has already occurred to your lungs cannot be reversed, correct treatment can slow down the progression of the disease and improve the COPD symptoms. This makes it easier for you to breathe and feel better. Stopping smoking is particularly effective at doing this. 1. 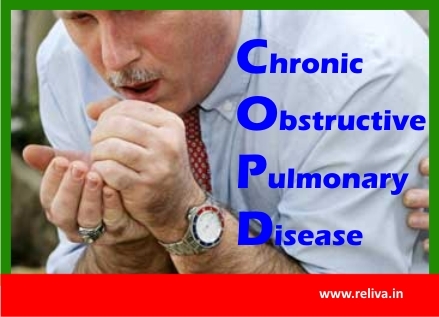 Medication : Majority of the COPD symptoms can be relieved with medication. Medicines must be taken as directed by your doctor. COPD medicines usually help in a lot ways that makes breathing easier. 2. Pulmonary rehabilitation : If you are having difficulty with your breathing or become short of breath when performing your normal daily routines, Pulmonary rehab can particularly be of great help. It may also help increase the amount of exercise you are capable of doing. Studies have shown that pulmonary rehabilitation programmes are extremely effective in treating COPD. The National Institute for Health and Clinical Excellence (NICE), UK has produced various documents supporting the use of pulmonary rehabilitation programmes. Pulmonary rehab programmes significantly improve the patient’s health by reducing breathlessness, providing ways to control the disease and by improving the patient’s ability to carry out daily activities, such as bathing and dressing. Pulmonary rehabilitation is a treatment program. It provides exercise training, education about COPD, tips on how to complete everyday activities without becoming so short of breath and advice on how to live better with your disease. Physiotherapists trained in pulmonary function are specially trained to run the pulmonary rehab for COPD patients. 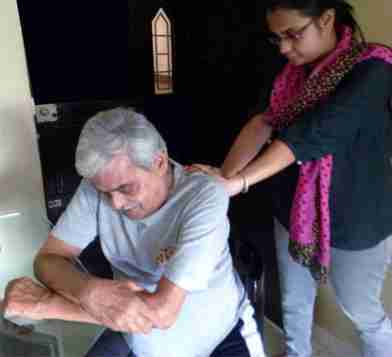 They use specialized physiotherapy techniques to help people cope with Chronic Obstructive Pulmonary Disease (COPD) and its symptoms. Pulmonary experts at ReLiva Physiotherapy & Rehab can design a program specific to your COPD condition and lifestyle and help you lead a better life with fewer incidents of flare-ups. People living with COPD can benefit enormously if they receive proper treatment including Pulmonary rehabilitation. They can live longer, have less pain, anxiety, depression and fatigue, a better quality of life and are more active and independent by simply learning to manage their condition properly. For some, asthma is a minor trouble. For others, it can be a major problem that interferes with daily activities and may lead to a life-threatening asthma attack. Asthma can’t be cured, but its symptoms can definitely be controlled. 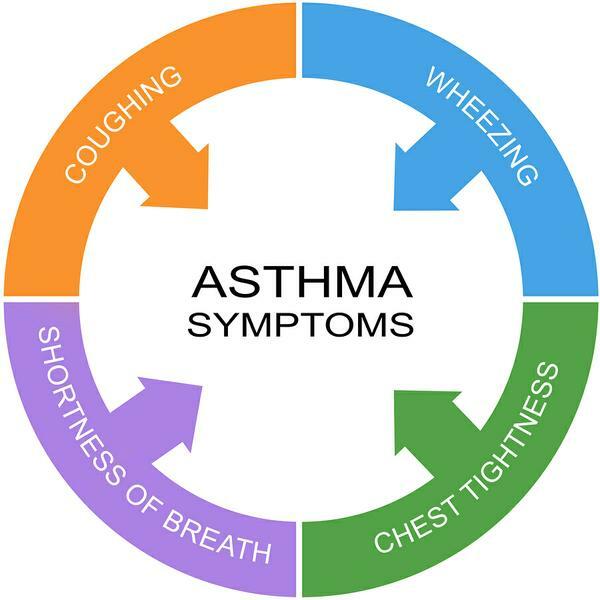 Because asthma often changes over time, it’s important that you work with your doctor to track your signs and symptoms and adjust the treatment as required. How Physiotherapy can help you for Asthma? Your physio helps you learn to manage the physical effects of your asthma. How you breathe is really important. Many people with asthma feel they need to get more air into their lungs. You may use your chest muscles to breathe air in and out quickly, through your mouth. If you make a habit of this, you’ll start to feel tired and unwell, and be more prone to asthma attacks. Your Physio at ReLiva will teach you how to breathe properly using the correct muscles when you’re resting. This will help you feel relaxed and you won’t make your asthma symptoms worse. They’ll also teach you how to breathe when you’re taking exercise. Read Tips for managing Asthma better at home by clicking here.